One of the biggest issues with high-end virtual reality experiences right now is that they often require people invest thousands of dollars in powerful computers in order to work. One solution to this is the VR arcade, where operators buy machines and then rent time on them to the public. HTC announced a new software platform Thursday that aims to help with the creation of such arcades. Viveport Arcade is designed to help arcade operators find games that are well-suited to the sort of public experience that they're building, while also helping developers better monetize their creations. It's built for the Taiwanese hardware maker's Vive headset, one of the leading offerings in the realm of high-end virtual reality headgear. It's a move by the company to try and democratize access to virtual reality, while also getting a cut of the burgeoning VR arcade business. Rikard Steiber, senior vice president of Virtual Reality at HTC, said that these arcades are a big hit in China. "We see this moving very strongly in China, where there are basically thousands of these arcade operators opening up," he said in an interview. "It's everything from the traditional internet cafes, to the arcades that are linked to cinemas, to basically independent operators and shopping malls opening them up as well." Viveport Arcade can help drive that business in a couple of ways: first, operators get curated, frequently refreshed software that's licensed for use in an arcade. Developers then have an opportunity to sell their software to those businesses and make money on its ongoing use. Arcade operators pre-buy time through Viveport Arcade that they can then use to let users run VR experiences. (Think of it as the arcade operator buying a stash of virtual tokens that they can then sell for users to rent time in a Vive.) When the credits are expended, HTC splits the proceeds evenly with the Vive developer whose software is used. In the future, HTC may also work with developers on creating titles that can only be used in arcades because they require special hardware or a particular physical setup. 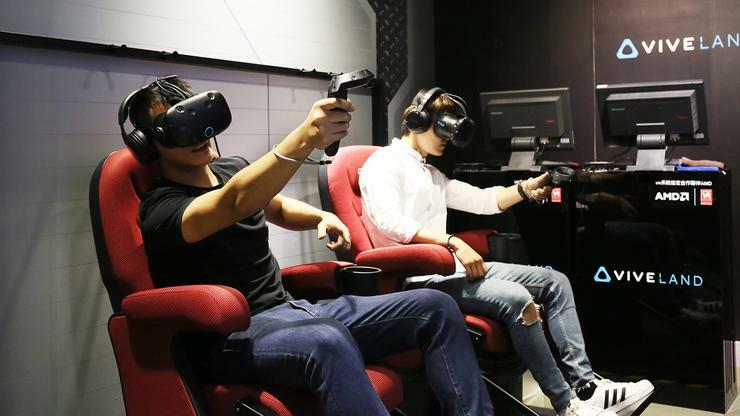 To inspire the creation of VR arcades, HTC also recently launched a VR theme park called Viveland in Taipei. It's meant to serve as an example of what VR arcades could be, to inspire other people to operate their own and spread virtual reality. Viveport Arcade is launching first in China and Taiwan. HTC says that it will then roll out to "thousands of locations" worldwide by the end of next year.